SECRETARIAT FOR INTENSIFYING OF POLITICAL DIALOGUE TO BE ESTABLISHED. Skopje, April 10 (MIA) - All leaders of the parliamentary political parties, who attended late Tuesday the meeting with President Boris Trajkovski, adopted his suggestion for establishing of a Secretariat for intensifying of the political dialogue in the country. The Secretariat is to be an advisory body of experts, to which political paries, groups, associations or individuals will submit their suggestions and remarks. According to Trajkovski, this body is aimed at improving of the political dialogue, by setting mechanisms for the future discussions. "The Secretariat will be comprised of experts, and commissions in charge of certain issues, such as local self-government, coordination of the legislation, census, border control, customs, combat against organized crime, corruption, money laundry etc. The commission president may also open discussion with non-governmental organizations or other institutions, and to submit reports from these meetings to the political parties. The Secretariat will serve as an advisor to and will be appointed by the President of the country, " Trajkovski said. The Secretariat may also cooperate with the international institutions, such as the OSCE and the Council of Europe, asking advice on certain issues. Upon all consultations and talks, the Government and the Parliament will make decisions, because as Trajkovski said, "the Secretariat is not intended to derogate these institutions but to bring transparency to the dialogue." Trajkovski said that the forthcoming census would be among the first issues on the Secretariat agenda. Asked whether changing of the Constitution would be discussed by the Secretariat, Trajkovski said that everything connected with legislation was planned for discussion. Trajkovski also said that today he received platforms form the parties DPA, VMRO-VMRO and the Roma Union. All of those documents would be reviewed by the Secretariat, planning the agenda for further political dialogue. 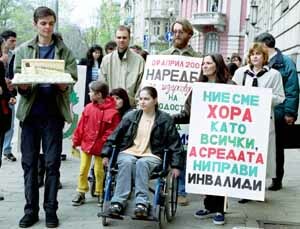 Disabled People Presented Antoine Nikolov with a Cake. Physically handicapped people and young volunteers from the "Independent Life" center were waiting for Antoine Nikolov, Chairman of Sofia City Council, in front of the municipality to present him with a cake. This was their way to thank him for taking care about the disabled citizens: recently the City Council adopted an ordinance that obliges the municipality to ensure special sidewalks for the physically handicapped and provide more friendly city environment for them. Special elevators will be installed in the underground and there will be slides for wheel-chairs in front of all public buildings with stairs at the entrance, pledged Nikolov. Czar Simeon II is a demagogue and non-democratic, Anastasia Mozer said. Commenting the establishment of the Czars movement, the Bulgarian Agrarian Union - Popular Union Chief Secretary Anastasia Mozer said that the statement of Czar Simeon II continued with the non-democratic tradition started by his predecessors Czar Ferdinand and Czar Boris III. According to Bulgarian Agrarian Union - Popular Union, the establishment of a political movement whose leader would be the only one to appoint and dismiss its members is an alarming fact. Anastasia Mozer also said maintaining that one could radically improve economic situation of all the groups of society within an 800-days period means to create a dangerous illusion.